This month’s Tea Time Treats Challenge is hosted by Karen at Lavender and Lovage, and is all about scones and buns. My plan had been to make some blue cheese and walnut scones, using the Exmoor Blue I picked up at our local cheese shop, the Cheddar Deli. Every Saturday morning they sell a different trio of cheeses for £5, and have a stall set up outside the shop to tempt the shoppers as they walk past. I sometimes get drawn to the stall whilst taking a break from my daughter’s dancing classes. I am especially likely to part with my fiver if the Cornish Yarg is included, as it reminds me of home (lots of my schoolfriends had Saturday jobs picking the stinging nettles used to wrap the cheese, though I’m sure my job in the local chip shop was much more glamorous!). 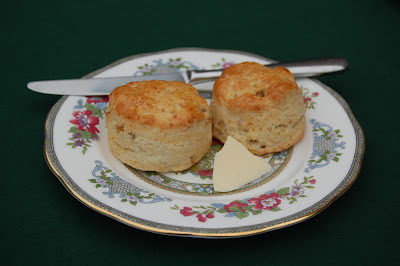 In the end the Exmoor Blue didn’t hang around long enough to be turned into scones, so I used parmesan instead. Maybe I will have another go if I get lured to the cheese stall tomorrow. I baked a few other bits and pieces today and used my very pretty Cath Kidston cake stand to turn them into an afternoon tea display. Unfortunately it was only me and the cat at home, so it soon got dismantled again, though people have since been dipping in and very little remains. On the middle tier there are strawberry cheesecake cupcakes, and on top we have chocolate macarons filled with Delia’s chocolate fudge icing. 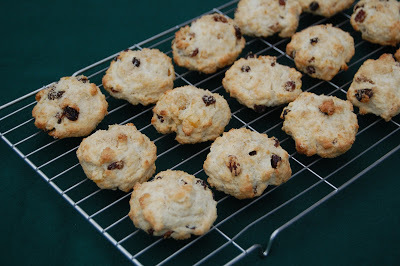 I also made a batch of rock cakes, which could be another entry for Karen’s virtual tea party. These were made using the recipe from my trusty Be-Ro cookbook (Grandma swears by it, though never in a foul mouthed manner of course!). My daughter loved them, and wants to have a go at making them herself before too long. I’m quite sure they weren’t as good as the ones Grandma makes, but very tasty nonetheless. 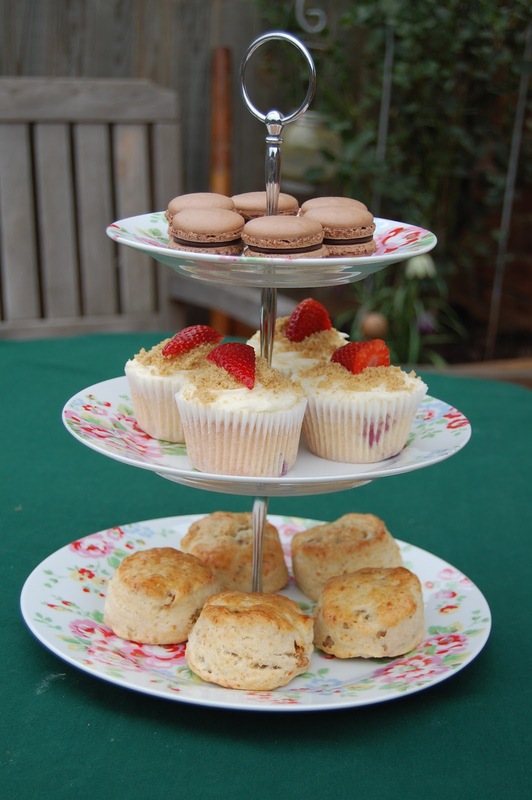 Pop over to Lavender and Lovage to see the other Tea Time Treats on offer when Karen does her round up. Next month’s challenge will be hosted by Kate from What Kate Baked. Oh Lucy, you make your baking sound so simple -just a few macaroons, cupcakes, rock cakes AND the most perfect looking scones. they all look lovely on your CK stand and I wish I'd been around to sample some – the strawberry creamcheese cupcakes sound rather good. So sad that yarg isn't made around our way any more. I knew loads of people who used to pick the nettle leaves too. Which chippie did you work in? You have got me hooked on scones now! I've been enjoying savoury versions with soup for lunch. Have you done any cooking with yarg? Not sure if the flavour is strong enough really. Might be good in a tart though. It was Walkers chippie! I ate a lot of mushy peas.